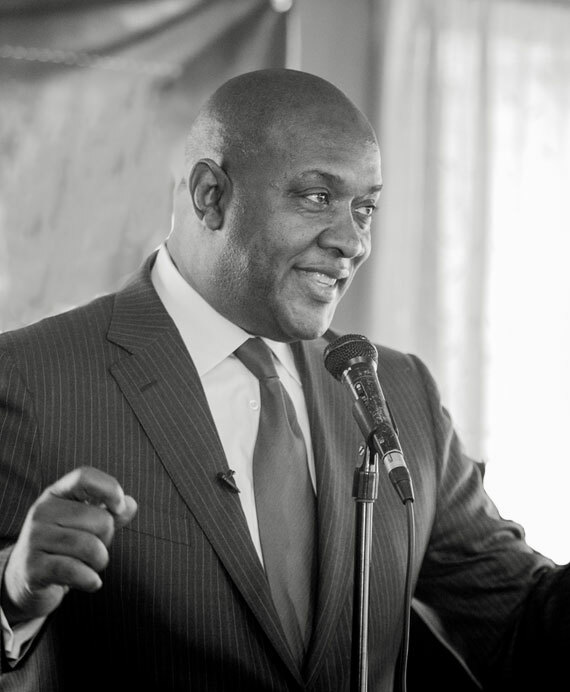 Dwight Evans has dedicated his life to the cause of urban renewal, working to give a voice those who too often live in the shadows, the poor and underserved. His commitment has resulted in the rebirth of once-blighted neighborhoods along Ogontz Avenue, in West Oak Lane, an area that now serves as a magnet for the middle-class. For over thirty years, Dwight has worked to rebuild neighborhoods block by block, and his commitment has paid off. Now that the fog of the Great Recession has lifted, thanks in large part to President Obama’s administration, Dwight believes now is the time for a new national policy for America’s cities. Dwight says there are too many neighborhoods that have been hollowed out for forty years, all while federal funding for our cities has declined. The second oldest of five kids, Dwight grew up in North Philadelphia. Today, he lives in the same neighborhood, just ten blocks from where he lived in high school. After graduating from the Community College of Philadelphia and LaSalle, Dwight went to work as a teacher in the School District of Philadelphia. He then went to work for the Urban League and became a community activist, working to stop blight and lower crime in his neighborhood. In 1980, Dwight Evans was first elected State Representative from the 203rd Legislative District and took office at the age of 26. Far from being a “go-along-get-along” legislator, Dwight stood out for his tenacity in working to help the people he represents. In 1986, Dwight led a hard-fought, historic effort to get approval to build a new convention center in Philadelphia, which has since provided tens of billions of dollars in economic impact, creating thousands of jobs. Dwight made history in 1990 by becoming the first African-American Chairman of the House Appropriations Committee. Dwight held the post for two decades, where he was instrumental in helping Philadelphia receive funding for economic development, job training, and education initiatives. A champion for teachers and innovation in education, Dwight helped start the West Oak Lane Charter School, a unionized school, which has helped teach thousands of kids from grades K-8. One of Dwight’s proudest achievements has been his work to combat hunger and increase access to quality foods. He took the lead on Pennsylvania’s Fresh Food Financing Initiative, linking public and private funds to provide grocery options in underserved areas. Because of this effort nearly 100 grocery stores have moved into areas that previously had no quality grocers, and more than 5,000 jobs have been created. The Obama administration championed Dwight’s approach and used the Pennsylvania initiative as a model for the nation, replicating it in several other cities across the country, including California, New York, New Jersey, Louisiana, and Illinois. Evans continues his fight to end “food deserts” in Philadelphia to this day. Dwight believes that now is the time for America to focus on the fact that despite a more urban population, Washington has ignored the need for a Federal urban plan. Since 1975, the population of America’s cities has grown by 100 million people. Yet, Federal funding to combat poverty, provide better housing and schools, and create jobs has not kept up. The Community Development Block Grant program, meant to battle poverty, provide affordable housing, and infrastructure development, provides less funding per capita than it did forty years ago. And in this century, the program has been cut 46%. Dwight Evans will be a voice for all those in the shadows of life, who want clean, safe neighborhoods that are affordable and have access to jobs and good schools. Evans will be a voice for urban America in Congress and will work to build a stronger Philadelphia.